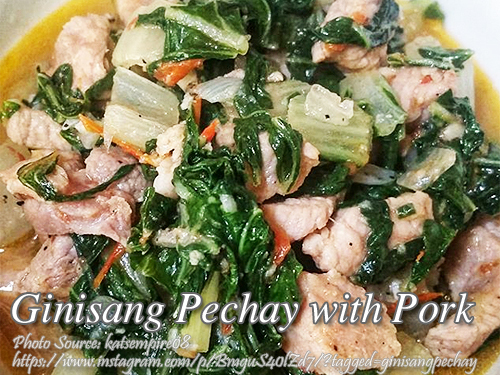 Ginisang pechay is a simple leafy vegetable dish made from sauteed pechay and pork. There are many Filipino dishes that contains pechay as one of the main vegetable ingredient. For example, in nilagang baka or nilagang baboy, pechay is the leafy vegetable that distinguishes this dish from other dishes. Although it can be substituted with other vegetable such as bok choy, still pechay is the most prefered. Anyway you can substitute this ginisang pechay recipe with bok choy because they are almost identical. The only difference is that the stem of bok choy is green and wider while on pechay it is white and thinner. You can also have a choice on using pork. Either sliced pork belly or ground pork can be used depending on your preference and availability. Heat cooking oil in a pan and saute garlic, tomato and onion until the onion and tomato is soft. Add in the pork and saute for 5 minutes. Then pour fish sauce and pepper. Pour the water and bring to a boil. Simmer for 10 minutes or until the pork is tender. Add in the pechay and cover. Cook for a 30 seconds and turn off heat. Then let is stand for another 5 minutes before serving.